The College was established as a professional organisation for registered nurses in 1992. In these pages we are detailing the establishment of the College and the main areas of work undertaken by the College across its history. The College has proved to be a strong voice for registered nurses and has been a consistent leader in the initial and ongoing development of the Nurse Practitioner role. The College logo was developed from the logo of the journal, Nursing Praxis in New Zealand Inc. To acknowledge the foundation of the College from the Nursing Praxis editorial team. Incorporated into Sam Rolleston’s design is the Nightingale lamp, which has come to symbolise nursing over the last 150 years. The central Koru indicates growth, activity and action. The mirrored lateral Koru indicate reflection. Transformation is shown by the change in the initial plain Koru design to a more elaborate one. The College since its inception maintained equal sharing between Māori and non-Māori with regard to positions of responsibility and decision-making processes. This was possibly a unique situation in the structure of organisations at the time of establishment. College of Nurses (NZ) Inc. Note: This timeline has been created to include major College events, milestones and contributors. It is not an exhaustive review and the College may change or add information in the future. A letter was sent across nursing from the editorial group of Nursing Praxis in New Zealand (Inc), not just to Praxis subscribers, regarding Nursing Praxis discontinuing its incorporated society status, this letter also raised the possibility of at the same time, establishing a New Zealand ‘College of Nursing’ and included a formal invitation to attend a forum to discuss the establishment of a College on 10-11 Aug 1991 in Palmerston North. Nursing Praxis meeting, Palmerston North to discuss establishment of College of Nursing. 130 nurses attended from across New Zealand and all practice areas. Their plan was to discuss and debate professional issues surrounding the possibility of the establishment of a New Zealand College of Nursing. If we had a NZ College of Nursing what would its purpose be? What would its structure be? What would its relationship to NZNA, NCMN, NZNU, PSA and to other organisations? At this meeting the Te Kaunihera o Nga Neehi Maori o Aotearoa proposed that the most appropriate body to be a College partner to include the bicultural structure with a New Zealand College of Nursing is Te Kaunihera o Nga Neehi Maori o Aotearoa. The College has operated a bicultural governance model since its establishment. A meeting was facilitated by Charmaine Hamilton on 11 August and following considerable discussion a project team was established to run for 3 months. Regional networks were also established to provide a forum for discussion to assist the project team and to inform other nurses of the developments. Laura Hawken, Isobel Hawley, Carole Peterson, Roseann Englefield, Irihapeti Ramsden, Jeanette Page, Mike Maddison. Jocelyn Peach, Gillian Rosemergy, Julie Mace, Kathy Wilson, Judy Gambarazzi, Jenny Carryer, Pam Marley, Ann Shaw, Chris Tuffnell, Nola Hatherly, Helen Lewis, Ann Coup, Judith Clare. Donations were sought from the nurses present to be used as a resource for the project. 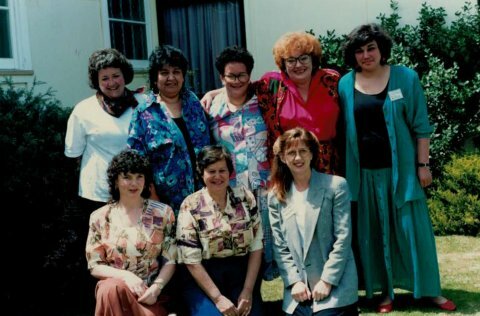 National working party for formation of the ‘College of Nursing’ 1991-1992 Mike Matterson, Isobel Hawley, Jeanette Page, Roseanne Englefield, Laura Hawken, Irihapiti Ramsden, Carol Peterson. Promotion of professional excellence in nursing practice in a negotiated relationship with Tangata Whenua. To provide a unified focus for examining issues relevant to nursing practice and health of the community. Where do enrolled nurses fit in? Tangata Whenua- how are they represented? Is the label ‘fellow’ appropriate? Clarifying membership criteria: what is professional excellence? The College now registered as the ‘College of Nurses, Aotearoa’ and work has begun on the Articles of Association. Articles of Association complete and being submitted to a lawyer. Letter to nurses seeking funding. A letter was sent to selected nurses and organisations seeking support for funding of the College prior to launch. At this stage enrolled nurses who met certain criteria relating to excellence in nursing and length of practice, could become members of the College. Those criteria involved demonstration of a significant commitment to local community or whanau health. Hawley, I. (1992). College of Nurses Aotearoa NZ: Update. Nursing Praxis in New Zealand, 7(1), 45-47. This article noted that the College was about to become incorporated and would soon be open for membership. The question of why it is called the ‘College of Nurses’ was addressed “…when both Australia and the United Kingdom have a College of Nursing. Nurses are people who carry out the activities which constitute nursing. We have adopted the policy to name the College after the people involved, in line with the College of Pharmacists and the College of Midwives etc.” (p.45). Nan Kinross, foundation Professor of Nursing Studies, Massey University. Dr Erihapeti Murchie and Lady Beverley Reeves: College Patrons. Dr Murchie formally opened the meeting and gave an inaugural address. Council members: Mary Wade, Mere Balzer. The minutes identify that College founder member Dr Irihapeti Ramsden co- published Kerri Hulme’s ‘The Bone People’ which went on to win the Man Booker Prize. Ideas for a Vision of the College in 5 years (1998) include; secure economic base, funding and supporting research, own education programme, membership of 25,000 nurses Full time paid president and staff, a good working relationship with NZNO. Interest in professional issues, not industrial. A strategic plan is requested from the membership led by the President Jenny Carryer and the secretary Laura Hawken. An academic committee is created to foster nursing research, monitor education issues and support and to mentor nurses as needed. Discussion on admission of new graduates to the College. No resolution but opinions sought. Praxis is to be delivered to all College members three times a year. College of Nurses releases a paper following widespread consultation which outlined several potential strategies which had been planned to allow nursing and the reformed health care system to work together with the ultimate beneficiary being the health of New Zealanders. The College is already involved in public debate and nursing issues including: cultural safety teaching in nursing, the future of enrolled nurses and the first year of practice. Jenny has completed a 3-year term as president but has been asked to continue in the role for a further 2 years. Lady Beverley Reeves resigns her role as non- Māori patron of the College. Members of the College council were interested at this stage in approaching Dr Marilyn Waring to be the new non-Māori patron. Jenny Carryer’s first AGM report after becoming Executive Director, following 5 AGMs as President. The College Council becomes the College Board with 6 members rather than eight. 3 Māori and 3 non- Māori. A permanent secretary is employed to support the Executive Director and the College. The College launches its first website noting the voluntary contribution of Mr Udo von Mulert for its establishment. The Taskforce, established by Minister of Health Hon Bill English, was made up of key stakeholders in nursing at the time, including the College of Nurses (Dr Jenny Carryer), Nurse Executives NZ (Beth Cooper-Liversedge), Nursing Council NZ (Judy Kilpatrick), New Zealand Nurses organisation (Brenda Wilson) and Ngāti Tāhinga (Denise Wilson). The Chair role was held initially by the Hon Dame Ann Hercus, and then by Dr Toni Ashton, Health Economist University of Auckland. 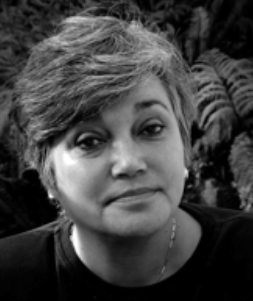 Brenda Wilson, NZNO Chief Executive, though part of the Taskforce group, rejected its findings and recommendations citing ‘elitist, insular’ attitudes, problems with a lack of unity in nursing leadership, post graduate programmes, prescribing, the nursing competencies and new nursing roles (Kai Tiaki, August 1998, p.13). Furthermore, communications show that the NZNO, at the time, believed they represented the nursing profession as a whole rather than other organisations who represented groups of nurses. They suggested some of the wording was antagonistic to medical profession and that nurses setting up their own primary care organisations was unrealistic. Despite this the Taskforce document received strong support from many areas of nursing, and the document was released by the Ministry without the support of the NZNO. The joint chairs of the Taskforce included: “The unwillingness of the NZNO to join consensus in forward -looking recommendations is, in the Taskforce’s view, itself a major barrier to progress for nursing in New Zealand” (p5). Following the release of the Taskforce document and in response to the evidence that tertiary institutions were beginning to plan advanced nursing practice programmes, mixed ideas around training, experience and preparation, and with work towards the extension of prescriptive authority for nurses underway, the College decides to hold a workshop in collaboration with New Zealand Nurses Organisation, Australian and New Zealand College of Mental Mealth Nurses, Council of Māori Nurses. Planned for March 1999. The goal was to heal the post taskforce divisions and to find a shared way forward for the development of advanced practice or more specifically the NP role. Putiputi O’Brien becomes one of the two College patrons and gifts the College a whakatauki from which the new College newsletter was named. “At last we have made the move into glossy print and we are celebrating this with the launch of our new name “Te Puawai” which so appropriately speaks of blossoming and enlightenment” (p1). The College starts to offer scholarships for post graduate or post-registration education. Politically aware regarding improvement of services. Nursing Council framework for PG education, with continuous refinement, endorsed. Impact of APN should be measurable in terms of demonstrated health gains and quality nursing outputs. This paper represented a collaborative effort between The College of Nurses, Nurse Educators in the Tertiary Sector, and the Nursing Council of New Zealand. It provided a research based and reflective discussion on the safe use of health service assistants. It provides pragmatic guidelines for successful and safe working relationships with health service assistants. In this manifesto the College set out a nursing perspective on the key health service challenges for an incoming government. This paper was created in consultation with Nurse Educators in the Tertiary Sector (NETS) and Nurse Executives NZ (NENZ). A collaborative and summarised response to the proposed re-introduction of a training programme for enrolled nurses (EN) planned by the NZNO and embodies in the Labour Party policy prior to their election as government. The document outlines the lack of evidence to support reinstatement of EN training, and that fragile, vulnerable groups such as the elderly need more, not less registered nurse care. It was believed that the brief procedural training of the EN created a level of risk. This supported the statement from the Council of Maori Nurses at the time, which issued a clear statement that they did not want reinstatement of EN training. College of Nurses Primary Health Care Strategy document released. “The key goal of this primary health care nursing strategy is to provide the platform for an efficient and equitable delivery of primary health care nursing in community settings” (p4). Irihapeti Ramsden is accorded the honour of He Poutokomanawa mo nga neehi o Aotearoa for her contribution to the College Project Committee; as a Foundation Board Member; and for the long-term support and advice to the College and contribution to nursing. Plans were made to establish a scholarship in her name commencing in 2004. A framework for activating primary health care nursing in New Zealand Report to the Ministry of Health from the Expert Advisory Group on Primary Health Care Nursing. Though not developed by the College, the College was significantly involved in this work. This report provides advice and recommendations to the Ministry of Health, District Health Boards and primary health organisations on a framework for primary health care nursing in New Zealand in line with the Governments Strategy. This framework is proposed as the central focus for developing a more cohesive and integrated primary health care nursing workforce that delivers the right services to the right people at the right time. Nurses are at the centre of this framework. They need to continue their ongoing commitment to their patient and client groups, extend their expert practice that makes a difference to others every day, enhance their clinical expertise, take opportunities to advance their own education, share their experiences and knowledge of how communities work, and, above all, work collaboratively with one other and with other health professionals to provide the best primary health care to all New Zealanders. The College of Nurses (NZ), NZNO, the Council of Maori Nurses and the Australian and New Zealand College of Mental Health Nurses. NPAC NZ had a memorandum of Understanding with the Nursing Council of NZ to work together to develop a strategy and process which supported the development of Nurse Practitioner endorsement. The College hosted the keynote speaker Professor Margarete Sandelowski, University of North Carolina at Chapel Hill. The College worked closely with NPAC-NZ to move forward the issue of NP employment and NP training processes in NZ. A paper authored by Jenny Carryer, Frances Hughes and NPAC-NZ was presented to Hon. Annette King in April. The paper outlined 2 options for progressing the development of Nurse practitioner training and employment and met with significant enthusiasm and support from the then health Minister Hon. Annette King. The paper recommended the establishment of a NZ steering committee or working group comprising representation from MoH/CTA, DHBNZ, and appropriate nursing membership. The outcome was a directive from the Minister to form this working group and the allocation of half a million dollars to progress an exploration of the above objectives. Purpose: to discuss the relationship of other advanced practice roles (CNS) to the NP role, Management and authorisation of US and Australian NPs Future role and contribution of NPNZ as a division of the College Liaison with the DHBNZ Nurse Practitioner Facilitation Programme. Employment issues for NPs. Problems with lack of understanding of the role and the services provided by an NP. Funding streams as a barrier to NP role development. Seeming inability for decision makers to manage funding streams to support role development. Barriers to NP practice; legislative and custom and practice issues based on ignorance. Current debate about designated to authorised prescribers as raised by the Therapeutic Products and Medicine’s Bill. Education barriers through poorly supported funding of nursing postgraduate education. 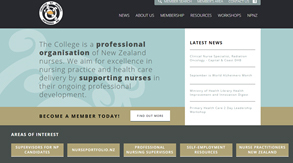 College of Nurses (NZ) and the New Zealand Nurses Organisation (NZNO). Joint report from the College and NZNO with recommendations for the improved utilisation of nurses in PHC. The report was directed to PHOs, Ministry of Health and DHBs. Margret Westwater- Hobbs, Narrative Therapist & Researcher, PhD candidate. Professor Donna Diers recently named a ‘living legend’ by the American Academy of Nursing. Liz Manning comes off the Board to take up a position as operations/ project manager, to support the growth of the College and the work of the ED. The help/ user guides have been completely rewritten and are presented in a new and easy to use way. The site is free to all College members. There is also the capacity to create new ‘institutions’ on the site. Massey University, Catalyst IT and the College presented at the 2017 Australasian Nurse Educators Conference on the NP students using the site through the Massey University Institution. Over 2016/17 the Nurse Executives NZ refreshed and updated the national PDRP framework. In their recommendations, they suggested that due to the proliferation of electronic portfolio sites for nurses in New Zealand there should be creation of a set of standards and principles to guide developers and organisations using these sites. The College created a service on the website in 2017 which offers NZ registered nurse providers of professional nursing supervision the chance to have an endorsed profile on the College website. Profiles are accessed through the ‘Professional Nursing Supervision’ section of the website. Nurses choose which supervisor they would like to approach independently of the College. About the College- an overview of what the College offers. Portfolios- why we do portfolios and how to set up a portfolio hard copy or ePortfolio. Bullying- Being bullied? Managing a bullying situation? 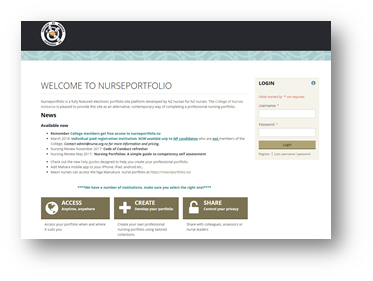 The College created a suite of online resources for the supervisors of NP candidates, recognizing that this group are often under-supported but vital to the continued development of New Zealand’s nurse practitioner (NP) workforce. There is multimedia mix of 5 short video clips, web links, key documents and guidelines, aimed to concisely deliver important messages to very busy people about becoming a supervisor to an NP candidate in a variety of settings including DHBs and GP practices. The College of Nurses (NZ) recognised the steady growth in self-employed nurses and as a result, created a suite of web-based resources to support nurses who may be considering this as a future career option. Planning a new business can feel daunting, especially for registered nurses and nurse practitioners, as unlike midwifery, physiotherapy or general practice, the New Zealand nursing profession does not have a strong history of self-employment. For nurses considering solo-self-employment, becoming an employer, clinical or non-clinical, whichever they choose, there are now links in the resource kit to support them at each stage, from set-up to self-care, as well as how to maintain the money and professional nursing registration. There are six sections in the resource which can be accessed in any order, each contains helpful advice, direction, prompts and links.